As I mentioned in yesterday’s article, I was drawn to the opportunity to see some wildlife in The Gambia. The truth is that there is plenty of different places to see wild animals in the country. However, a lot of that wildlife is “made easy” for tourists and the place I got the shot below is one of those places. The Kachikally Sacred Crocodile Pools in Bakau are of significant traditional value. Locals used to come to these waters – and many still do – to pray. The crocodile is seen as a symbol of fertility among the local people, and those looking for help in that regard often came here. In fact, in some cases women were actually dipped into these pools among with the lurking crocs. Today, the pool is a bit of a tourist trap. There is a great little museum leading into the park, but when you arrive at the pools themselves you’ll be greeted by a slew of people wanting to help you pet a crocodile, or take your picture with one, for a couple bucks. Still, it’s an amazing place and really cool to be able to get so close to such powerful and incredible creatures. No matter how tame they may be, it’s still a very humbling experience being next to them. Obviously there’s a little bit of post editing done to this image, although not as much as you’d think. I shot the image focusing on the eyes because this croc had such a powerful stare that I really wanted to bring that out. As I got playing with the image I kept coming back to the eyes – how could I make them stand out more? So in the end I simply used Lightroom’s adjustment brush and used it to de-saturated the entire image except for the eyes. I then increased the saturation of the greens a bit. It may look like I cooked the eyes a lot, but the truth is they really were very green. Anyways, de-saturating an image while leaving colour on a focal point is often a good way of focusing the viewers attention. I don’t use this method all to often, but when I do I’m generally happy with how the images turn out. Nice photo. 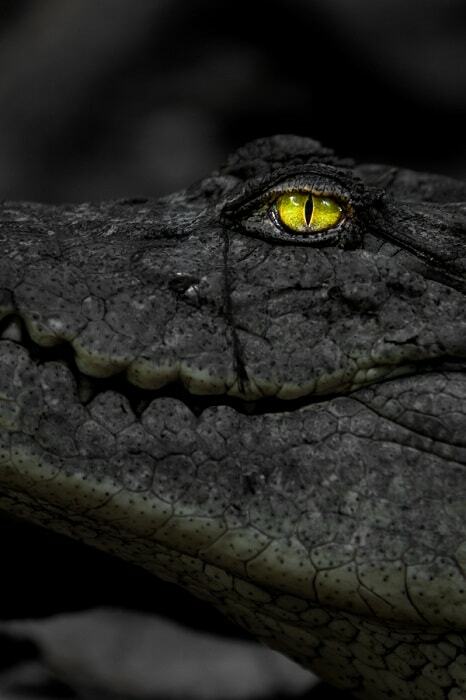 Although the crocodile looks ugly it has beautiful eyes. Amazing contrast of colours. How close did you get to the crocodile? I got REALLY close to that croc Shalu – Probably too close haha. Definitely drawn to the eye. It’s actually quite a beautiful colour. Thanks Dean… crocs, and all reptiles for that matter, have awesome eyes don’t they?